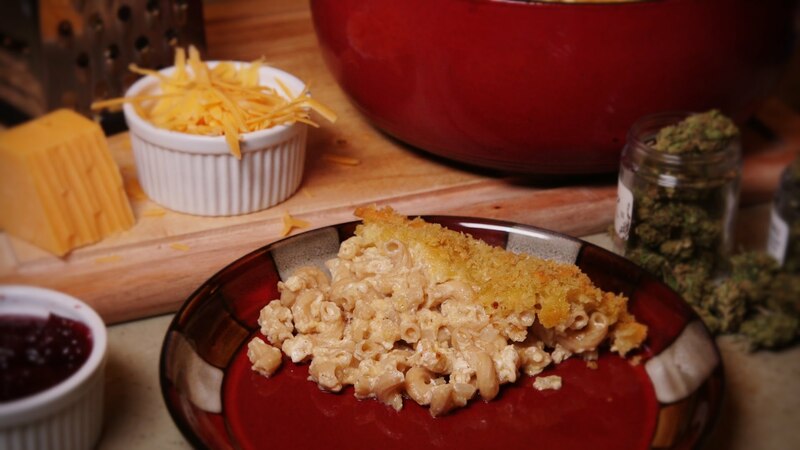 A fast recipe for Marijuana Infused Mac and Cheese . Serve as a side at a Holiday feast, or add some ham, turkey or bacon for a complete meal fit for a cannabis king! Spread ground marijuana evenly into a small oven safe dish, double wrap in foil. Place in preheated oven undisturbed for [timer length=15]15 Minutes[/timer] . Remove from oven and let cool. Meanwhile bring butter to med-low heat in a small boiler. As the white milk fat renders to the top, scoop it out with a spoon. When the foam stop rendering out of the oil remove from heat and strain milk fat out through cheese cloth. Return butter into top of double boiler over medium heat and ample water. While the pasta is cooking and in a separate med/large pot, Add the remaining melted cannabutter. Whisk in the flour and keep it moving for about five minutes over very low heat. (Do not let it boil or simmer) Make sure it’s free of lumps. Stir in the milk and onion. Melt the 3 separated tablespoons of cannabutter in a saute pan and toss the bread crumbs to coat. Top the macaroni with the bread crumbs. Bake for about [timer length=30]30 Minutes[/timer] or until topping is browned. Remove from oven and rest a few minutes before serving. Spread ground marijuana evenly into a small oven safe dish, double wrap in foil. Place in preheated oven undisturbed for 15 Minutes . Remove from oven and let cool. Melt the 3 separated tablespoons of cannabutter in a saute pan and toss the bread crumbs to coat. Top the macaroni with the bread crumbs. Bake for about 30 Minutes or until topping is browned.